Darwin Connelly bought the business from Curly Personius, (hence the name) in 1955. It was a small box car diner, with bar seating and a few booths. We have customers who remember working here as a teen, they love to share their fond memories of that simple time. Over the years we have changed in size and housed a mobile Bell museum, Darwin had attached to the back of the restaurant. Many locals recall walking through the worldly collection he acquired. 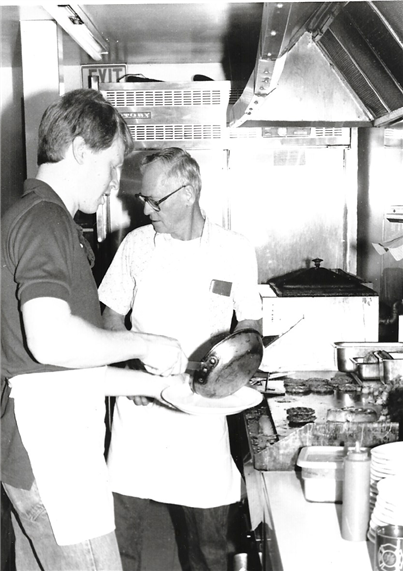 In 1992 Darwin's son Curt took over running the restaurant. Since then we have remodeled 3 times, we now feature custom sit down booths. We pride ourselves on a clean friendly atmosphere, so you may enjoy your dining experience. Hopefully you will become a faithful customer, that we can get to know for years to come. All of our food is still made from scratch, just as it originated 62 years ago! We hand cut our steaks and chicken and buy quility seafood. We do our best to accommodate to people's diets and allergies. We are a gluten friendly restaurant, our soups and sauces are made with rice flour. Come in and visit this family tradition and enjoy a great atmosphere and great service!! This has been our philosophy for decades!